This is Part 2 of 5 Best Sub-$1,000 Mac Notebooks for Gamers. That's right, it's a tie! Apple is really pulling out the stops these days - and gaining market share. With the unprecedented value of the newest versions of the MacBook White and with a hot refurbished price on Apple's first new entry into the "professional" line of compact notebooks in four years (aside from the MacBook Air), there really is something to be said about these units. First of all, a MacBook White can be purchased brand new for under $1,000. It has everything that you could possibly want for the low-to-mid-range gamer right out of the box, plus a one-year warranty. Granted, the GeForce 9400M is not a powerhouse graphics chip by any means, but it is definitely capable and can handle some heavy 3D gaming - for under $1,000! The screens on the 13" MacBook Pro and MacBook White are a crystal clear with 1280 x 800 resolution, plenty of real estate for this size, and with their small footprints, and 7 hour built-in battery, they offer excellent portability and plenty of use during longer trips. Attach either of these to an external monitor, and they double nicely as your desktop. If I had to choose an overall winner, it would probably be the refurbished 13" MacBook Pro with it's sleek unibody case, illuminated keyboard, FireWire 800 port, and 8 GB RAM ceiling. Then again, a refurbished October 2008 MacBook with its user serviceable, removable battery can be had for $749 from Apple. Now that's a steal! I'll leave it up to you, my dedicated readers, to make the call. Balancing features vs. price is always a tough call. Both models have a great balance of both. If you're interested in a 13" MacBook or MacBook Pro, check out Low End Mac's Best 13" MacBook and MacBook Pro Prices. 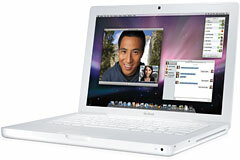 The 2.4 GHz Unibody MacBook provides more processing power than the MacBook White and the entry-level 13" MacBook Pro. It is currently available refurbished for $999, but it lacks one important feature: FireWire. As a gamer, and as anyone who is doing any productive work, hasn't FireWire Target Disk mode saved your backside at least on one occasion or more with the Macs you use? Without this feature, you could run into some trouble if you have a disk problem, need to install software, or would like to quickly and securely transfer some files between two Macs. Apple corrected this omission with the 13" Unibody MacBook Pro. Okay, maybe I threw the 12" 1.5 GHz PowerBook G4 in just for fun, since I already have an Aluminum PowerBook on the list, but this is still one of the best gaming portables - especially for tight spaces. In my honest opinion, it has only recently been surpassed by the 13" Unibody MacBook Pro as the compact notebook of choice. It's lightweight,and perfect for airplane, train, and any other travel, providing excellent entertainment value and gaming possibilities in a neat 12" package. It meets spec for Doom 3 and should handle it fine. Not bad for a little guy that's now four years old! 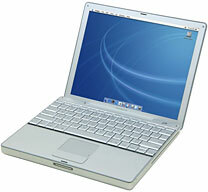 If you're interested in a 12" PowerBook G4, check out Low End Mac's Best 12" PowerBook Prices. 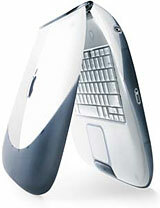 On looks alone, the iBook Clamshell Graphite SE is a winner, but the Pismo outshines it. The Pismo just does what this iBook does, but better, and with much more expansion and upgrade potential. Compared side-by-side to a 400 MHz Pismo, this iBook is almost identical in terms of processing power (Pismo 400 MHz has slower clock, but larger L2 cache at 1 MB vs. 512k). On looks alone, it gets an honorable mention, and that's something. 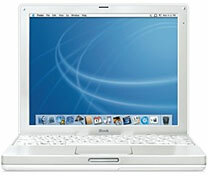 If you're interested in a G3 iBook, check out Low End Mac's Best G3 iBook Prices. The 1.42 GHz iBook G4* should have had a couple build to order options for a better video card (Radeon 9600 64 MB or Radeon 9700 128 MB dual link DVI), and processor (G4 1.67 GHz). That's all it was missing. Granted that these options would have brought the cost of purchase up on a "consumer" unit and would have specked it right at the top of the Aluminum G4 line, but this would have had provided much more to the user over the product lifetime and would have increased after-market value of these units considerably, especially after the GMA graphics debacle in the MacBooks that followed it. In fact, had these options been available, this iBook, rather than the hi-res Aluminum PowerBook G4, would probably have been a better gamer's machine, since it wouldn't have had all the extra bells and whistles that the "professional" line did (like FireWire 800, CardBus, higher resolution screen, etc. ), but it would still have had the most important things for gaming - a fast processor and a powerful video card. Instead, we got stuck with the absolute bare-minimum for Core Image - the Radeon 9550 with 32 MB of VRAM. Not quite enough Apple. As a result the 1.67 GHz hi-res is king of the G4 portables for gamers! If you're interested in a G4 iBook, check out Low End Mac's Best G4 iBook Prices. * Apple also made a 12" 1.33 GHz model that matched the 14" in all respects except for being a bit smaller, a bit lighter, and a little bit slower.